The bright Sb spiral galaxy M106 is perhaps about 21 to 25 million light years distant and is receding at 537 km/sec. It may be a member of the Ursa Major cloud, a loose agglomeration of galaxies which probably also homes M108 and M109. M106 is usually classified as peculiar "normal" spiral of type Sb (or Sbp). Since the 1950s, M106 has been known to have a much larger extent in the radio radiation than in visual light. In 1943, Carl K. Seyfert had listed this galaxy among the galaxies with emission line spectra from their nuclei, which are now called Seyfert galaxies. 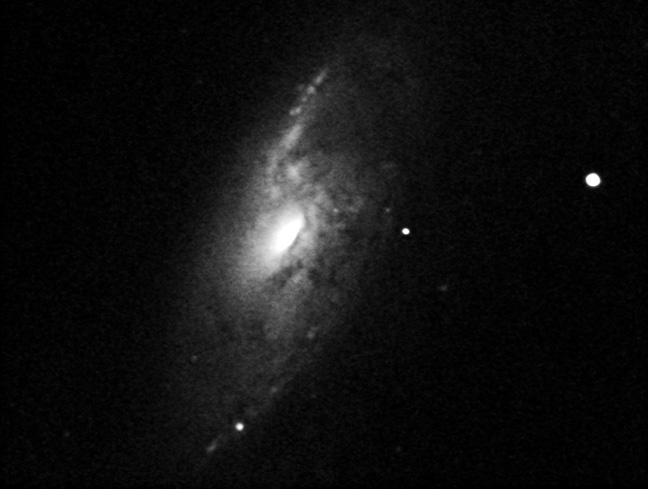 A supernova (1981K) occured im M106 in August 1981 and reached 16th magnitude.